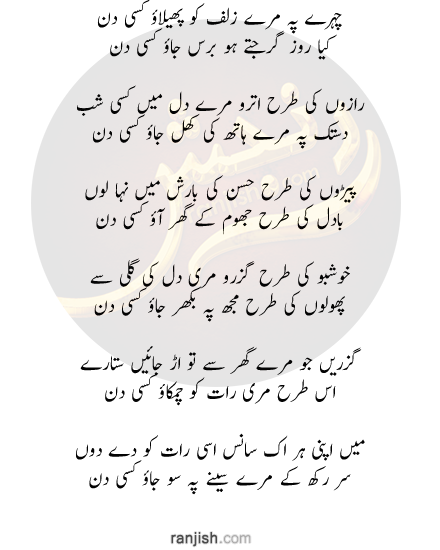 Ranjish.com has lots of Urdu Amjad Islam Amjad Poetry. Feel free to add your own Amjad Islam Amjad Shayari here. Amjad Islam Amjad is one of the best poets the world has ever seen. Amjad Islam Amjad Poetry is very popular among middle aged people. has come up with lots of poetry books. We will be trying to bring all of Amjad islam amjad’s poetry books in text format here so you can enjoy reading his poetry online. His poetry books include Fishar, Barzakh, Us par, Satwan dar, and Zara phir say kehna. 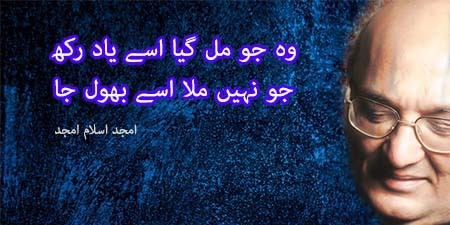 Ranjish.com is the ultimate place for Amjad Islam Amjad Poetry fans. Aayinon main akss na hon to hairat rehti hai..
Loh-e-sukhan pr aese “amjad” shohrat rehti hai..
Yeh jo saanp-seerhi ka khail hai..
Abhi saath they dono hum-navaa..
Dard phail jaye to, Aik waqt aata hai..
Ranjishon ki baaton ko bhulna bhi parta hai..
Raiza raiza toot chuka hoon andar se..
Kahan aa ke rukne they raste kahan morr tha ussay bhool ja..
Woh tha aik daryaa visaal ka sau utar geya ussay bhool ja..
We update our poetry database on daily basis so keep coming back for more Amjad Islam Amjad.